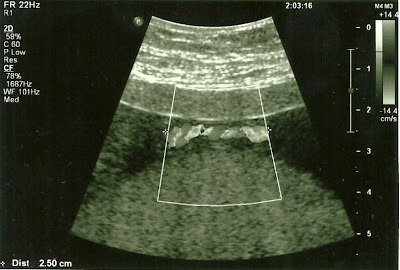 Cradles and Graves: It's a . . .
. . . normal-looking cord according to the ultrasound tech and my doctor today. At least for now, all signs seem to indicate that placenta and cord are doing their jobs. This is by no means a guarantee that things will continue to look good, but it looks good today and we're thankful for that. We are still VERY anxious going into this next month. March is the fifth month of this pregnancy and we'll hopefully be passing the 18 week and 21 week marks when we lost Miles and Jeremiah. I'm keeping my commitments in March to a bare minimum - there's just no way around the fact that it's going to be a tough month. Today we also found out that baby is a GIRL! At 16w0d she is measuring 16w2d. All body parts are looking good and she was moving around a lot. In fact, this past week I've been able to feel her move for the first time :) Q and I are a long way off from daring to talk names, but since we now know it's a girl I figured she needs a better name here than just "the baby". So for now I'll call her Mei-mei, which means "little sister" in Chinese and is pronounced like the month May. We are still hoping to keep the news from the kids until we (hopefully!) make it safely through March, but that may prove tricky as I'm starting to look pretty "fat". All the cord pics are being sent to Dr. Collins and we'll see what he thinks about them. For those who are as obsessive as I am about umbilical cords, more pictures from today can be seen here. This is quite possibly the only blog out there where you'll be seeing tons of pictures of the cord and not the baby! YAY! YAY! YAY!!!! I am so happy for all the above and a GIRL <3 <3 <3. I am going to keep praying for uneventful pregnancy and a strong cord!! So happy Mei-mei's cord is looking good! :-D All the best for a safe and uneventful March. I LOVE good news! I am so jealous that you got to find out the gender! You are only like, 5 days ahead of me but my Doc is making me wait until 18 weeks! UGH! March 18th can't get here soon enough! Ahhhh thank goodness. I had been wondering when we'd see your post and had my fingers crossed for very good news, which this is. HOping for an uneventful March and some peace of mind this spring. Oh honey...what WONDERFUL news!! A baby girl....yay! I'm so happy for you!!! So glad to hear everything is looking so good....Yippee!!!! Fabulous news! I know that had to be a huge relief to know the cord looks great - and a girl! Amazing!!! YAY! SO glad everything looks good and very exciting to have a little girl! Congrats! Congrats! Mei-mei is such a sweet nickname! That is wonderful that the cord looks good!